Have you ever planned a fun day trip or road trip, and then wondered what you should eat while you are travelling? Do you think you would travel more if you didn't have to pay money for fast food along the way? Are you trying to come up with healthy things to eat while you are in the car? Today I'm going to share my favorite travel meal. Wraps! These are perfect for day trips, road trips, camping trips, and any other time I need to make an easy meal to take on the go. They are healthy, inexpensive, and they travel well. Seriously, wraps are one of the best things to eat when you are travelling. You can fill them up with lots of veggies so they are very healthy. They cost way less than a stop at a fast food restaurant. And you don't have to worry about them getting squished like you do with sandwiches made out of bread. My husband and I actually realized by accident that wraps are a great travel meal. We were getting ready to go on a 3 week trip from Texas to Utah and so we were trying to eat the rest of the food that was in our fridge. 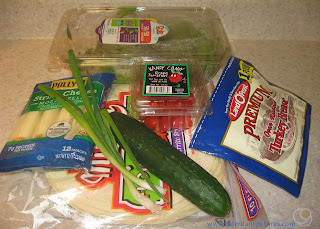 The day before the trip we still had leftover tortillas, cheese, lunch meat, and a few vegetables. We realized that we had all the ingredients that we needed to make wraps so one of us hurried and threw those together. We packed them in the car and figured we'd find time to eat them along the way. That time turned out to be while we were driving and all the kids were asleep. I was so impressed that we could have a healthy/fast meal without needing to stop. Seven months later, during another trip to Utah, I went to the store really fast to grab something before meeting a friend at a park for lunch. I was pretty sick of the pre-packaged stuff I'd been eating, and I was craving something fresh. So I bought everything to make wraps. When I met up with my friend it wasn't a big deal to quickly make a few wraps for lunch. Ever since then I pretty much always pack wraps when I'm planning on heading out for an adventure. So how do I make wraps? Well, I'm going to show you a really simple way. I think the reason that I didn't originally think of wraps as a travel food was because I thought they were complicated. My sister works in a banquet kitchen and she makes these delicious wraps that have at least ten ingredients - four of which a normal person would not have just sitting around. It felt like a major production every time she made wraps. My wraps on the other hand only have 6 basic ingredients. 1. Start by laying out one tortilla flat. I prefer white tortillas because they are usually the cheapest. You can get wheat or spinach ones if you'd like, but I've found that they really aren't that much healthier while they are usually at least $1 more expensive. 2. 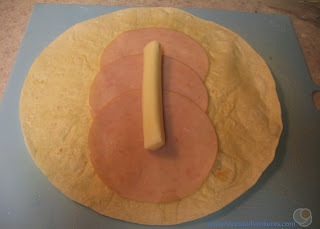 Lay lunch meat on the center of the tortilla. You can make the layer as thick as you like, but I recommend at least three slices. 3. Then lay your cheese on top of the meat. 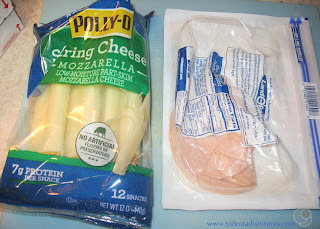 I prefer string cheese because its easy (especially when travelling), but sliced cheese works too. I tried shredded cheese once, and it worked okay, but it was a little messy. 4. 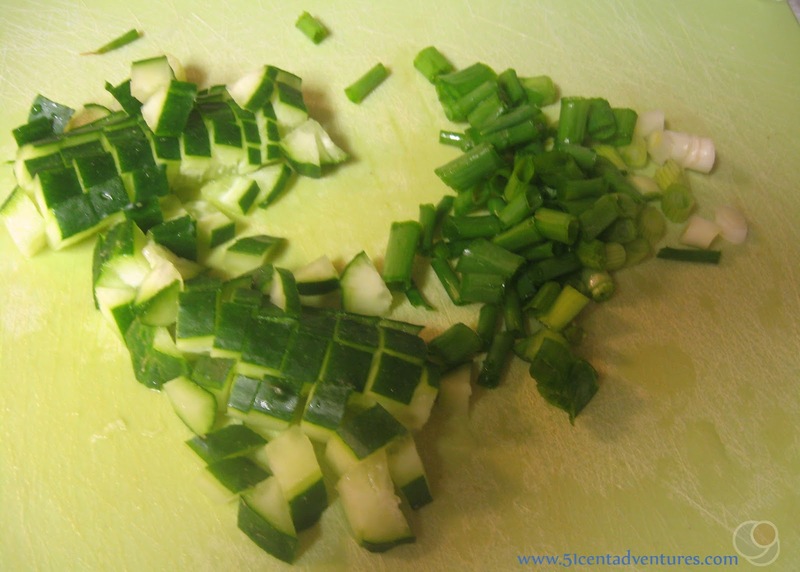 Chop up your vegetables. Really any veggies work. I even add raisins and almonds to the mix sometimes. 5. Place a small handful of lettuce on top of the meat and cheese. Again, I like easy stuff so I prefer to use pre-washed lettuce. I have a very bad habit of never eating lettuce that I have to wash myself. I figure I'd rather spend a little bit more money on the pre-washed stuff, than let a whole head of lettuce go to waste in my fridge. 6. Add chopped vegetables on top of the lettuce. Make sure everything is still in the center of your tortilla. 7. Add condiments. I don't really like condiments so I usually skip this step. 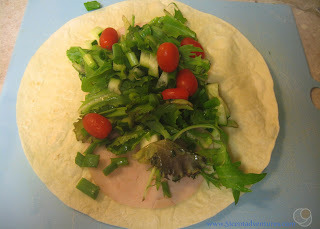 If you do put dressing on your wrap, make sure add it lightly. The last thing you want is a lot of dressing falling on your lap while your trying to eat. 8. 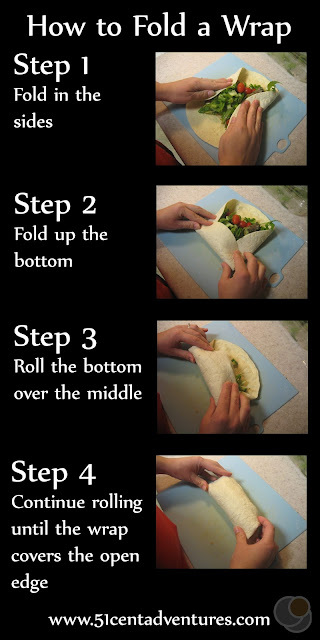 Fold the wrap. First turn your wrap one quarter turn so that one of the sides is now on the bottom. Then fold in the sides, followed by the bottom. Roll the bottom of the wrap over the middle and then continue rolling so that the wrap covers the open edge of the tortilla. I know that all sounds like a bunch of gobbledygook so here is a nice little picture. Hopefully this helps. Really, it gets easier with practice. 9. 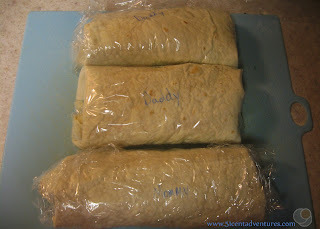 Cover the wrap in plastic wrap so it will stay closed and fresh. I usually label our wraps because my husband doesn't like tomatoes. 10. Pack in a cooler and enjoy when you are hungry. 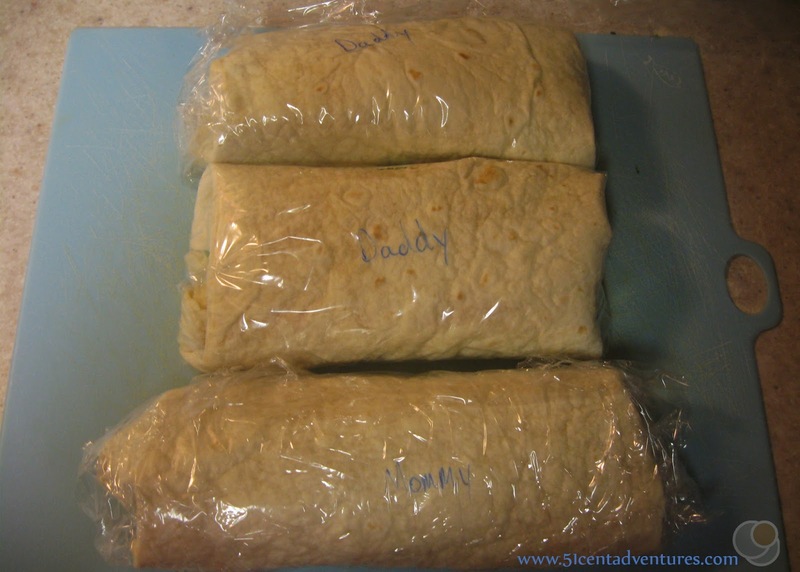 I should add that these wraps probably can stay good for a few days in a fridge, but should be eaten within 24 hours of going into a cooler. When we are going on a long road trip we usually eat our wraps on the first day of the trip. Now some of you may be wondering, "Don't you have four kids? What do they eat?" I often wonder the same thing. Actually they hate to eat any food that is mixed together. So what I usually do is bring along extra lunch meat and string cheese. They love to eat those foods - just not together. So there you have it. A really simple meal that is easy to take anywhere. If you liked this post you should check out my directions for how to make easy homemade trail mix. And then you should look around this blog for ideas of places you can visit while eating your wraps and trail mix.